We reserve the right to remove any content or material from the wiki or servers that we deem inappropriate. Inappropriate is defined as per the discretion of the Project Manager of a project, the Technical Leadership Council, or the Strategic Leadership Board. In the event of any disagreement between the Project Manager, Council, and Board, the final decision rests with the Board. The COIN-OR Foundation reserves the right to refuse service or access to any individual or group at its discretion. Please do not post or submit any material that is abusive, harmful, threatening, or otherwise inappropriate. We strongly encourage positive contributions to the community. 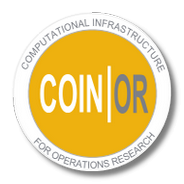 The COIN-OR Foundation offers no warranty and accepts no liability for the use of the website, wiki, servers, or any open source software made available through the website, wiki, or servers. For any particular project, all project contributors should adhere to the terms of the license or licenses used by that project and provide the level of documentation required by the project. Please see ‘How to Submit Code to COIN-OR’ for more information. Any contributions made to the wiki or website are considered the intellectual property of the COIN-OR Foundation unless an alternate arrangement has been negotiated with the COIN-OR Foundation before making the contribution. Contact the of the COIN-OR Foundation if you wish to negotiate an alternate arrangement.